Here's the first Polka & Bloom pattern of 2012. It's called Fresh Blooms - named by one of the subscribers to the newsletter. Yup, sometimes I have... activities like that in the newsletter: help name a pattern and you could win a copy. Always exciting to see the ideas people come up with! Anyway, back to Fresh Blooms - a very appropriate name seeing as we're just getting started on this year, and what better way to do that than with a bit of stitching. And you can dream of spring while you stitch. I can't wait for spring - it's so cold today, I'm wearing fingerless gloves as I'm writing this! 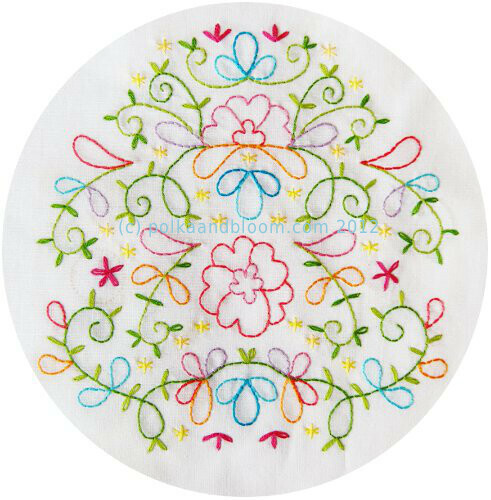 Oh and it is also the first pattern in the 2012 Polka & Bloom pattern subscription, and you can download it straight away when you sign up for the subscription.